I was a huge fan of the Paper Bag Skirt from Banana Republic when I tried it on and of course, I purchased it on the spot. I was hesitant from just the pictures online, because it looked like the elastic waist was quite muffin-top inducing. Now I realize I’m just a bit too traumatized by the tightly bound elastic waist skirts J.Crew has been pumping out. 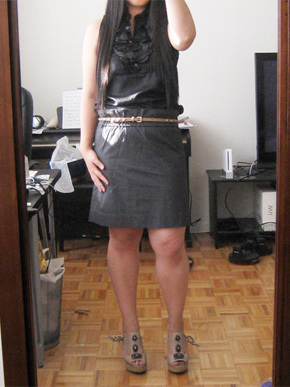 This skirt, in contrast, is unbelievably comfortable because of the waist. It’s a wide-ribbed elastic, which means it gently clings onto you, comfortably wearable either at the waist or at the hip. Surprisingly though, the material feels just like one of those sporty, waterproof jogging shorts or windbreakers, and if it was not for the detailing at the waist, I would mistake it for a sporty skort of some sort. 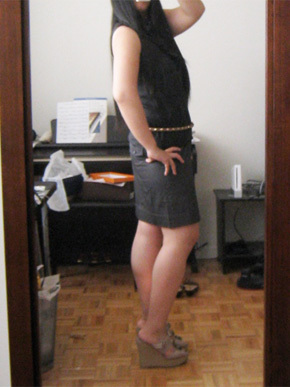 When I wore it today with my top untucked, I did not feel dressed up as if I was wearing a pencil skirt. I felt like I was about to bust out jogging at any time. But when I paired with a dressier top (tucked in) and heels, I felt this was as perfect as skirts get – so comfortable, slight A-line shape, accessible and not obtrusive pockets, and perfect length. Sizing wise, I picked up my usual skirt size and it fits perfectly. I’m definitely going to pick this up in another color. Just wish they had more colors! Get it here from Banana Republic for $59.50. I absolutely love this skirt. It is on sale now (got it 40% the sale section) plus had a student discount. Yours was the only review I could find. 🙂 But anyway, I got this skirt in the green stone and the black. It is so awesome and comfortable! Alexis – This skirt is seriously my go-to skirt now because it is sooo comfortable but looks and functions like classic A-line skirts. Not too long or too short either. I wish they made them in more colors!